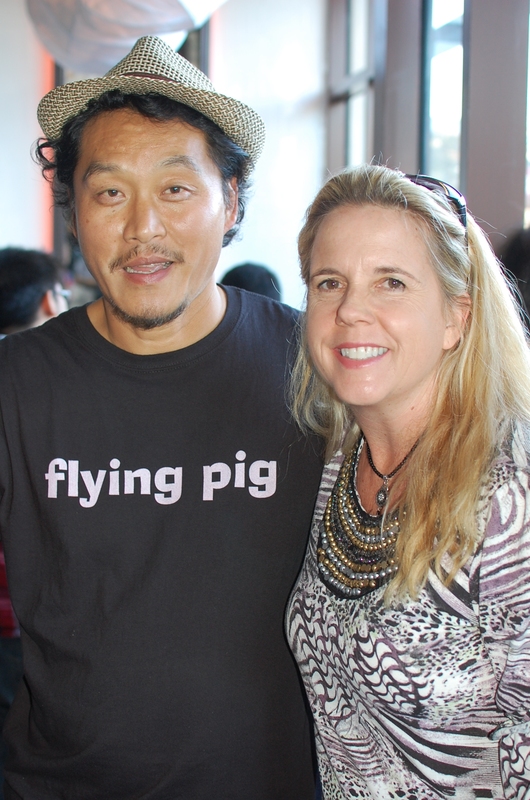 Rick and I had the opportunity to meet celebrity gourmet food truck chef, Joe Kim at his new cafe, Flying Pig. Ever since his debut on Oprah and Food Network’s Great Food Truck Race, Kim has attracted quite a following on Facebook and Twitter. Fans crave his braised pork belly bun, duck fried rice and peanut butter carnitas. Now with an urban chic cafe half a block from the Japanese American Museum, Kim offers draft and bottle beers, wine and sake to be paired with his fresh halibut with a spicy chocolate sauce and pineapple salsa or a marinated skirt steak with lemongrass, garlic and green curry. Prices are reasonable, atmosphere is fun and if all goes well, Kim is planning to open another cafe in Hollywood, maybe on Sunset Blvd. Follow the Flying Pig truck daily by going to facebook.com/flyingpigcafe. The cafe is located at 141 S. Central Ave. (213)621-0300.